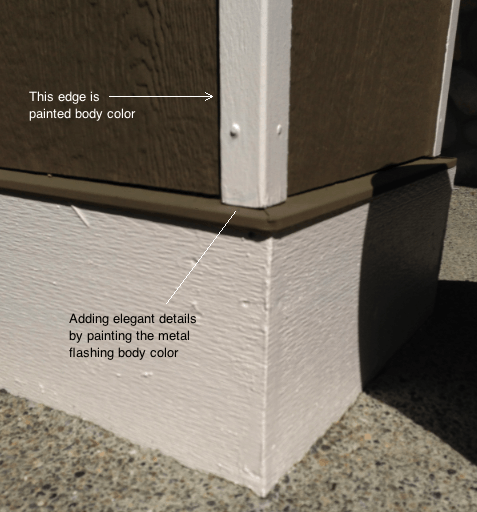 An overview of exterior edges; which is painted what color. This page is an extension of your estimate document. When it comes to edges and corners, exterior painting is a bit different than painting inside. Painting the outside has more in common with production painting and its purpose is preservation of the substrate as well as adding appeal to the home. Elegant Painting follows standard procedure and applies all paint products according to manufacturer recommendation. 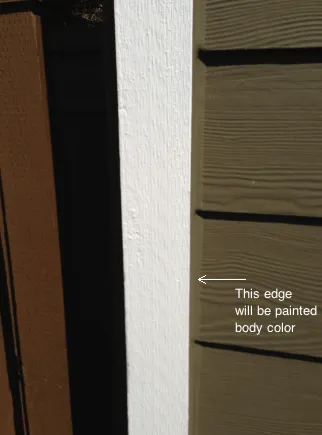 This 1×4 pre-primed spruce board is designed to hide the joint between siding pieces. In most modern homes, this piece is used to create a sealed connection between siding pieces and also serves cosmetic purposes. If your home already has plenty of trim in the front, you may avoid the “busy” look by painting the corner pieces same color as the siding. 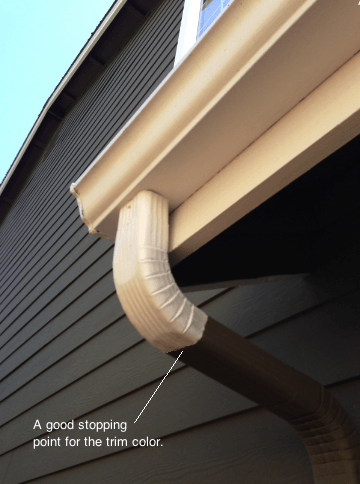 When the downspout is installed directly on top the trim piece, a portion of the corner trim is visible under the downspout. This small portion is painted body color to improve precision and avoid an unsightly stripe behind the downspout. 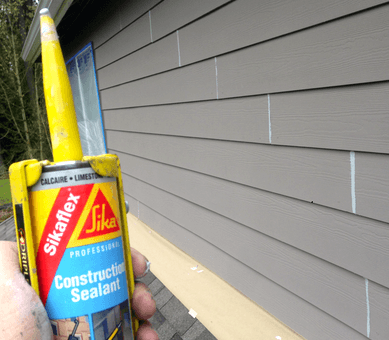 Since most siding is butted right upto the door casing, and the siding is often caulked into the casing, painting only the face of the trim is the only way to produce a neat and straight line. Other options include painting door and trim same color as siding to make them all disappear a bit, or paint door and it’s trim boards all trim color to make them stand out. Downspouts are usually painted the same color of the surface they are attached to. 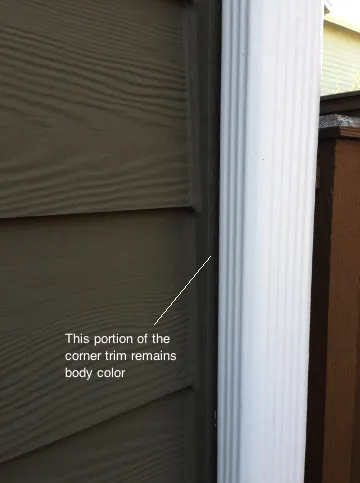 If a downspout is installed on a trim piece, it should be painted the color of the trim piece, but sometimes a downspout runs down the siding and it should be painted siding color to help make it look less visible. Not every home has posts or pillars, but when they do, we try to ad an elegant touch by painting any trim on the surface. Painting the metal flashing the body color is one way of adding our elegant painting detail signature to any home. How do we know which edge should be painted the interior color and which edge exterior? Here’s a simple method; Stand outside and open the door. 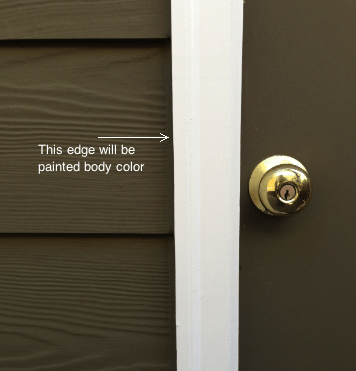 The edge you see from the outside should be painted the exterior color. If the interior of the door is being painted, simply repeat this method from the inside; any edge visible from the inside should be painted interior color. Fiber cement siding is a type of popular artificial siding that can withstand all kinds of climates, including our damp Northwest weather. Currently 5.5 million homes in America are being protected by this type of materials. Fiber cement boards are made of sand, cement and cellulose fibers. Complete with artificial texture, this siding resembles wood siding and even imitation shingles. Once installed and painted, the exterior fiber cement boards require very little maintenance, and is not susceptible to termites or rot. Do fiber cement boards need to be painted? Yes. James Hardy of Hardieplank siding recommends painting the siding using a 100% acrylic exterior paint, such as the Benjamin Moore Exterior SuperSpec used by Elegant Painting. If fiber cement boards are not painted when a paint job is due, the moisture content of the substrate falls bellow normal levels, and they may warp, bend, and crack. Does it cost more to paint a house with fiber cement siding? No. 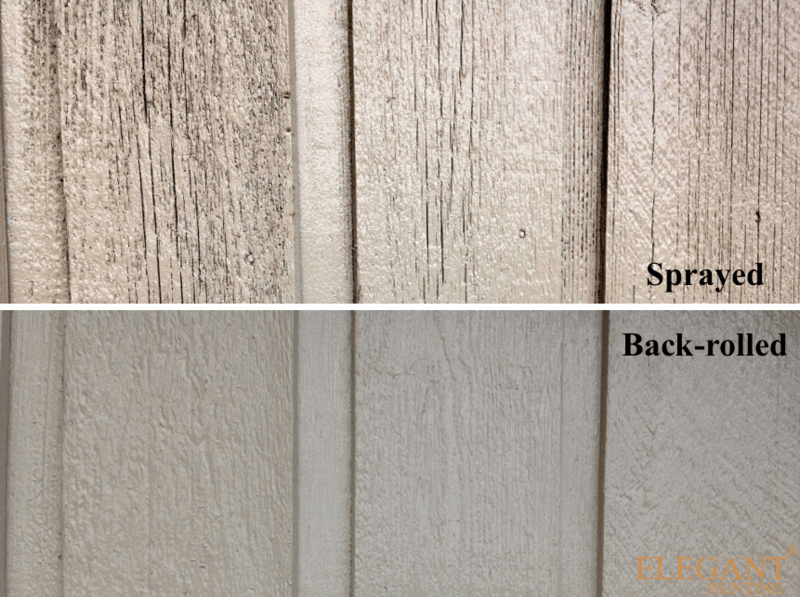 Elegant painting bids are lower for homes that have fiber cement siding. Fiber cement boards take and hold paint extremely well, and are less labor intensive when it comes to back-rolling the paint, resulting in lowered labor and paint costs, which are handed directly down to home-owners. Yes. Per manufacturer recommendation, joints and gaps will be caulked to prevent moisture and wind driven rain from entering the walls. We also caulk around windows, doors, eaves, and other edges to make to prevent leaks. Using our premium flexible, rubber based calking called Sika, which is manufactured by The Sika Group of America. This is not ordinary caulk. This material dies into a hard yet flexible rubber that is similar to materials used in car tires. It remains strong and flexible well after it is dried and cured. Failing caulk on previously caulked joints are removed and a fresh coat is applied. 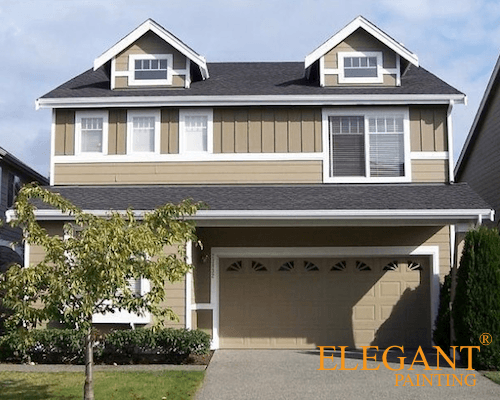 How does Elegant painting apply paint on fiber cement siding? 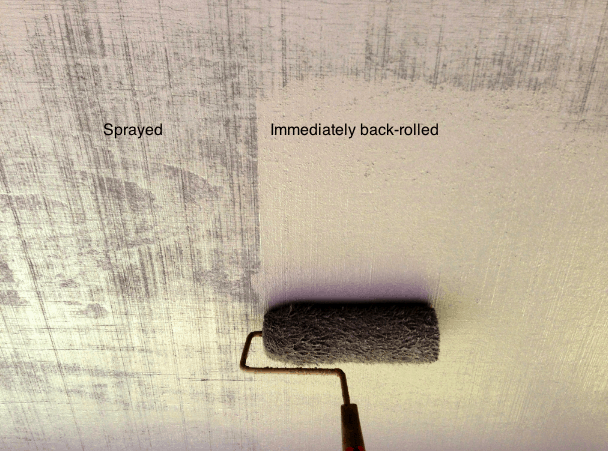 After our standard preparation procedures, paint is applied with airless sprayers, and the surface is back-rolled before the paint dries. 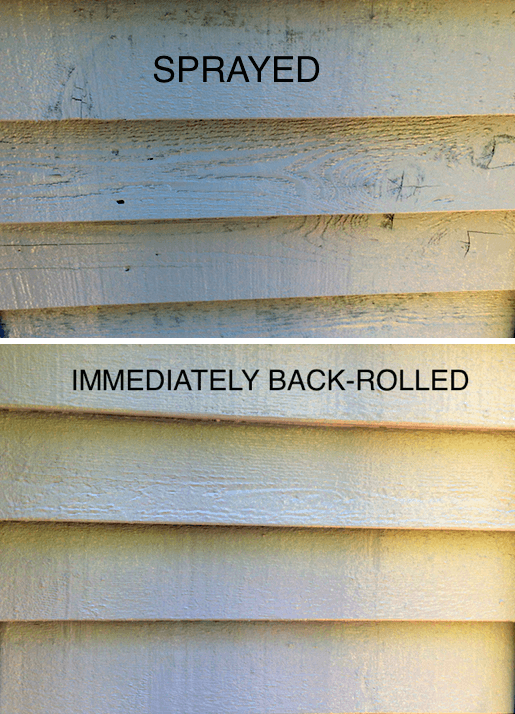 Back-rolling is absolutely essential on all exterior siding. This method forces the paint into the substrate and produces a very even finish. Back-rolling adds 3-5 years to the life of our already durable paint job. As a professional painting company, we take care of our clients, our employees and our painting equipment. We use sprayers, ladders, and paint brushes. Like many other businesses, the current economic conditions have taught us to be more efficient with our equipment and minimize waste. The problem with paint brushes is keeping them clean and efficient for long periods of time. If your paintbrush is worn out and out of shape, it will not produce straight lines, and it will hold smaller amounts of paint, resulting in increased labor costs. Paying a team member to clean brushes on daily basis can be costly, so we came up with a quick and effective method of cleaning paint brushes and keeping them in good shape. Some of the paintbrushes in the photos bellow have been used by Elegant Painting crew for seven plus years!! With this method, you do not need any special paint brush cleaning chemicals, there is little to no muscle involved, and your brushes come out clean as new. This old brush has been in service for over 7 years and was ready to be retired. After cleaning, it may not be suitable for any precise interior work, but it can be used for exterior projects for a few more years. 18 Volt Ryobi driver with wire brush attachment. Start by filling up your 5 gallon paint bucket about 3/4 with clean water. You will be using this water to hold your bucket in place as you work, and also for rinsing as you wire brush. Now clamp your brush on the inside of the brush. You can also simply hold the brush in place, if you have strong hands and use protective gloves, but keep in mind the wire brush can slip and get your hands! With your driver set in reverse, approach the brush from the right side. Use both hands, and wire brush bristles, and the heel of bristles. You can also adjust your clamp and wire brush the handle of the brush. You may need to stop and use a putty knife to scrape away more stubborn layers of dried paint. Make sure the driver is set to reverse, and is rotating counter clockwise. Wire brush the edges of the paint brush, stop often and dip the brush in water. Exterior house painting is not something you think about often. 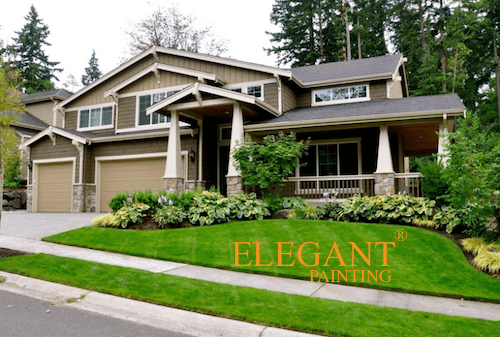 Unlike interior painting, most home-owners consider exterior house painting when the current condition of the paint-job is poor, and not when they get bored with the color. While a fresh paint-job offers great protection and preserves your exterior surfaces, it also communicates your character, taste, and your lifestyle. Why are you painting the house? Are you just bored with the color? Is your current paint in poor shape? 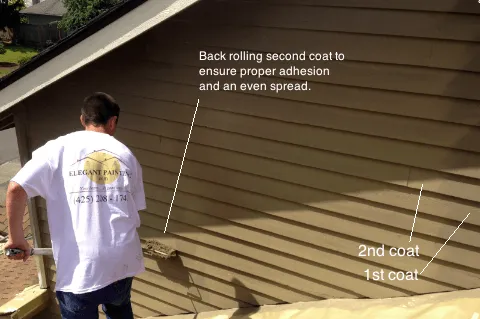 Do you need fresh coats to protect the siding against the elements? Is your home being prepared to go on the market? How happy are you with our current paint colors? 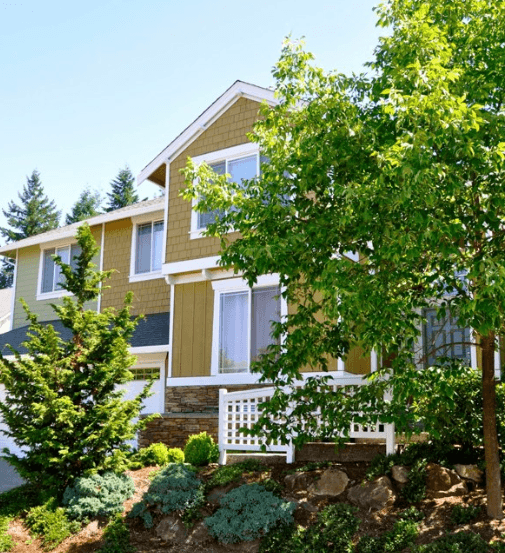 Exterior colors play an important role in preparing a house for resale. Keep in mind tastes vary. What appears absolutely beautiful to you, might be so unpleasant to a potential buyer that they even may walk away from the property. Most buyers decide on a house at first sight and color effects our cognition in unpredictable ways. When choosing house colors, in preparation for placing a house on the market, it is important to choose neutral colors that appeal to every taste. Here, the idea is not to attract buyers with your unique custom colors, but to try and avoid repelling anyone due to taste variation. If you have no intentions of selling the house, then you are free to choose colors based on your very own personal taste. all paint brands produce most of their paints in thousands of different colors. So where do you begin? Everyone has a favorite color. Take a quick trip to your local Benjamin Moore store and check our their swatches. Try to narrow it down to 5 colors, and grab some swatches. Spend a few days looking at them. Be sure to look at the swatches in different lighting conditions. We recommend looking at the swatches in the shake and keeping in mind that we have very few sunny days. Paint swatches are produce via printers and they are on paper. It is always best to see the actual paint, on the actual surface that will be painted. If you are working with Elegant painting, narrow down your search to 5 colors, and email them to us. We would be happy to stop by and paint large patches of your chosen colors on the siding or trim. We may also have have recommendations on colors similar to your choices, but more suitable for exterior. Please feel free to call, email or text us with any house painting questions. We are not just a business, We are here to help!